New findings highlight the need to protect young people from harsh military training environments and inadequate safeguards in cadet forces. Many British army recruits are young and vulnerable. 22 out of every 100 UK army recruits are under eighteen – children, by international standards. At enlistment, British recruits are more likely to be 16 than any other age. While multiple reports and studies demonstrate the dangerous long-term impacts of early enlistment and relate this to combat itself, little research has been done on the impacts of military training. A new report from Veterans for Peace UK, released today (4 July 2017), tackles the nature and effect of military training using veterans’ testimonies and around 200 studies (mainly from the UK and USA). The First Ambush? Effects of army training and employment is an in-depth exploration of the nature of training and what it does to recruits. In short, the purpose of that training, from the initial stages onwards, is to mould young civilians as soldiers; to follow orders by reflex and to kill on demand. That, the report explains, demands unquestioning obedience, aggression, antagonism. Normal inhibition to killing must be overpowered through a dehumanising training regime. The lasting effects of this training are many and set out thematically across the 72-page report in terms such as ‘forced change’ and ‘moulding the soldier’. At any time - and for any reason - training instructors can deprive recruits of sleep, food, shelter or permission to go the lavatory. Harsh treatment known as beastings are commonplace. These involve insults and shouting as well as physical violence aimed at recruits in order to humiliate.One section – entitled ‘Stripping the Civilian’ – focuses on the basic components of army training. This aims to suppress and overpower recruits’ civilian identities; in effect stripping these away. This begins with isolation – for the first few weeks trainees, heads shaved and in uniform, have no right to see family or friends; they are not allowed to leave base and cannot terminate their contract. That is the case even when the recruit is under 18 years of age. The military also dominates recruits by denying them any choice of personal affairs; their daily routine is controlled totally down to tiny details such as the right and wrong way to stand, make a bed or fold clothes. At any time - and for any reason - training instructors can deprive recruits of sleep, food, shelter or permission to go the lavatory. Harsh treatment known as beastings are commonplace. These involve insults and shouting as well as physical violence aimed at recruits in order to humiliate. Instructors will punish a struggling recruit who is, as British Infantry veteran James Florey has characterised it, 'singled out for weakness, humiliated, and isolated.' The purpose is to instil fear in the group and the individual so as to bring about compliance. It builds the unitary nature of the group because often the whole group is punished for ‘the individual’s apparent failure’. The First Ambush shows that military training and culture can be harmful, with health implications even before a soldier reaches the frontlines - such as substance abuse, mental illness, domestic abuse and sexual harassment. The youngest and most disadvantaged recruits are the most vulnerable to these issues. Further, the Army likes to present itself as a social mobility boost for young people, but in fact the youngest and most disadvantaged are also the most likely to drop out of the army early and be at risk of unemployment and deprivation. We discuss this further here. The First Ambush also demonstrates that the risk of violent offending and heavy drinking rises after joining the army. A study in 2013 found that enlistees were less likely to commit crime in general after enlistment, but more likely to commit violent and sexual offences. After deployment, the risk is doubled relative to the pre-enlistment offending rate. This weekend, celebrations of the British armed forces will take place across the UK. Councils up and down the country are organising and supporting military parades, displays of weapons and 'military assets' and military-themed family entertainment. The national Armed Forces Day event will be held in Liverpool, with city centre and waterfront events including Army, Navy and RAF 'villages', family zones, fly-pasts and a gun salute. The event is a big one. Its promotion by Culture Liverpool puts it on par with Mersey River Festival, Liverpool International Music Festival and SGT Pepper at 50. Activists from Merseyside Peace Network with John Lennon's famous call for peace outside The Cavern Club. They will be holding a peace vigil at Liverpool's Armed Forces Day. It is a day to reflect on how we got to the point where the armed forces are singled out from other public service professions – some of whom also face everyday danger – for a day of national celebration. What are the long-term implications of further entrenching militarism into our culture and equating armed service with 'family-fun'? The first Armed Forces Day took place in 2009. It was instituted on the basis of government fear that the military were losing the battle for public opinion after it failures in Iraq and Afghanistan. The day is billed as, 'a chance to show your support and salute our forces for all they do.' Any concern that what the armed forces do should be open to debate is blotted out. This demonstration of public support for serving personnel is then transformed into support for the institutions of the military, as councils and partner organisations become its promoters and its recruiting sergeants. How much does this cost the nation, and local councils each year when other services are facing cuts and closure? Recent evidence suggests that councils have to dip into their reserves, sometimes digging deep, to fund Armed Forces Day. Despite a grant from the Ministry of Defence and some commercial sponsorship, the day is likely to cost a significant amount of money for Liverpool City Council who has to underwrite it and find the extra funding needed. In fact the MoD grant for this national event is only £25,000. Whether or not they wish to attend or support the military, the people of Liverpool will be paying and, quite possibly, seeing cuts to council services deepened as a result. A tale of two cities: a personal reflection by Rhianna Louise on the display of the UK's potential for armed violence on the streets of Liverpool alongside its more radical history. Get guns off our streets. Liverpool, Saturday 24 June 2017. What would Lennon do on Liverpool’s Armed Forces Day? John Lennon and Yoko Ono at the first day of their Bed-In for Peace in the Amsterdam Hilton Hotel. "Peace is possible, and it isn't just inevitable to have violence... so advertise yourself that you're for peace if you believe in it." Imagine John Lennon alive today, with a ticket to ride back to his hometown, Liverpool, on 24 June 2017. He’s not going there to be a voice for peace, equality and social justice. He’s not preparing for another anti-war bed-in with Yoko Ono. No, John Lennon is abandoning his beloved peace movement for this year’s Armed Forces Day, hosted by Liverpool. He’s off to join the crowds who’ll be cheering on the troops, waving flags proudly at guns and tanks and admiring displays of weaponry. If this sounds unlikely, I expect you’ll see the irony in the hometown of one of the world’s most iconic anti-war activists, hosting a gigantic public celebration of the war machine. It saddens me deeply to think about Liverpool, a city I know and love, transformed into a spectacle of war, with warplanes in the sky with the liver birds, field gun races and combat displays. Amongst the sponsors of the event are BAE Systems, one of the largest arms manufacturers in the world. This is a company that consistently sells weapons to oppressive regimes, despite the sanitised version of its activities that Culture Liverpool project. The annual Armed Forces Day is a relatively new occasion in the UK, introduced long after John Lennon's death, on the basis of government fear that the military were losing the battle for public opinion. Events take place across the UK to celebrate it (this year there are over 350), and local councils bid to host the national event, for which they receive some funding and sponsorship, but also spend significant amounts of their own money. Had this occurred during Lennon's lifetime, surely he’d be more likely to be rallying the crowds to sing peace songs than taking part in the glorification of military prowess. Armed Forces Day is on Saturday 24 June, or 17 June in some places. Over 350 events which package war as entertainment with military vehicles, weapons and recruiting stalls will be taking place across the UK. The national Armed Forces Day event is taking place in Liverpool. Here we list events taking place with provide a message of peace and an alternative to militarism. Let us know of others which we can help promote. Send us your reports and pictures from Armed Forces Day or post on social media. Get the facts! If you would like a batch of free Before you sign up business cards to distribute, get in touch. 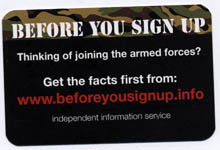 The Before you sign up website looks at what soldiers think of the army, what happens in army training and in war, and, what happens if you want to leave. As the national event, Armed Forces Day in Liverpool will be big. As well as a parade, there will be three miliary zones, each displaying the 'military assets' of one of the three armed forces. There will also be 'street theatre and family zones' and a display area for 'capability demonstrations'. The tanks and weaponry, child-orientated events, recruitment stalls and combat displays will, ironically, be alongside the John Lennon Peace Monument, unveiled by Julian and Cynthia Lennon in 2010. Liverpool was the hometown of John Lennon, one of the world's most renowned peace activists. Merseyside Peace Network will be meeting at 11 am on 24 June and are holding a peace vigil at 12-12.45 and 2-2.45 at the gates of Albert Dock with a Give Peace a Chance banner.